I could do giveaway's everyday, they are so fun! One of my newest sponsors, Starfish Jewelry Designs, has graciously agreed to give one of you lucky my sweet Savannah readers ANYTHING your heart desires off her website! I recently got this one below. I love the flower in the center and of course I did a C and S for my 2 kiddos! This one is amazing too! It's really hard to make a decision. And how perfect is this one for Valentine's day? Take a look at all their fabulous creations right here. Then head back here to leave me a comment on which one you would pick if you won! step 2~For another entry become a follower of her creative and fun blog. And step 3~follow starfish designs on twitter! Please leave a separate comment for each step! I will pick a random winner on Friday this week! p.s. I am on twitter too, although I don't post a whole lot, my goal in 2011 is to get more involved in it! Thx for doing the giveaway.....I would pick the "Whitney" necklace....love it! I am a new follower of the Star Fish blog.....love the jewelry! I am now following Star Fish on Twitter. I would have to go for the Tori necklace. hey I just discovered her blog love her neclaces my fav is the one with the little gold heat in the middle she is also a new follower of mine and my beachbag giveawa ...hop on over to get some beach love...at beachhouse etc. I love the "coco" necklace......something about that old fashioned key and the dangles, gotta love it!! I am already a follower of her blog......LOVE the jewelry! I'm in love with the "coco" necklace, so vintage chic!! It was so hard to choose ~ I'd go with the Whitney. I follow starfish designs on twitter. I'd choose the Tori - love it! I already follow the Starfish blog - and have for a while. Love it! 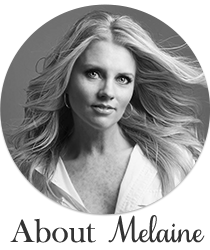 Oooooh I would do the Malorie. that one is soo sweet. I LOVE the Laguna necklace. 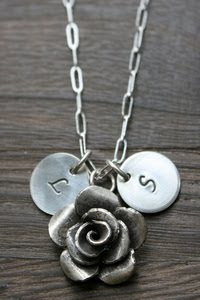 The flower on it is super cute and always love to have my kid's initials close by! Those are some fab pieces of jewerly! I love the Laguna I love your blog thanks for the giveaway. I love the Laguna great blog thanks for the giveaway. I would pick the Madision is I win!!!!!!!!!!!!! Thanks! I just became a follower of her awesome blog too!! of course, I would take any of them! But love the Lauren or the Tori. I was the last comment. about the lauren or the Tori. I would pick the Sorelle and then have my twins names added. Love this jewelry! and your blog too! love Mia and would do an E for my baby girl. 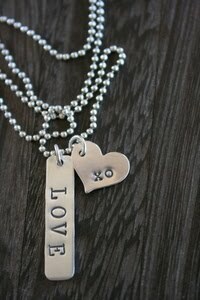 I also love the heart charm with the two initials. Its all so adorable! I love the "Abby" and "Grace" necklaces!! I am following her new blog now too! Thanks! If I won I would choose the London...love it and all of her stuff! I am now a follower of Starfish blog...so glad I found it through your blog! I'd choose the Taylor necklace on the 18" chain - LOVE it! I'm now a follower of The Starfish Blog. Ooooo.....such pretty stuff! I love the Rose necklace you featured and probably would pick that!!! Thanks for the opportunity! Oh my gosh...Oh my golly!! The jewelry is absolutely fabulous!! I can't pick just one!! My first choice would be the Chloe necklacd with the beautify word "Happy" on it and my other choice would have to be "Avalon" with the key and the the word "Bliss" as the other charm. This is a word that has such great meainging to me! I would be so delighted to win such a fabulous gift. I follow Starfish Designs on Twitter (and I follow you, too!). I love the Coco necklace with a few of the sweetheart charms to go with it! 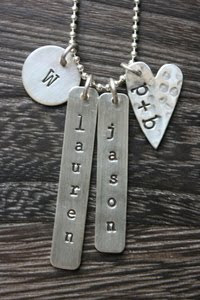 I would have my husband and girls' names on the charms because they hold the key to my heart! Cheesy I know but that is what I would pick! I'd tweet about it, but :( I don't tweet! I sing......? lol! I would pick the Lauren, and have my girls and husband's name on it! please pick me!!! love the chloe necklace! the word would be grace. Okay, at first, I was going to say Lauren (since that is my daugter's name), but upon further examination, I love Coco!! I think I would pick the "Sorelle" necklace . . . perfect for summer with the starfish! Love your blog! I have been a starfish follower for awhile - love her designs! I especially love Grace, it would be perfect for my kids names! Wow, so hard to decide. I love either the Laguna or the Whitney! So hard to choose. Probably Madison or Macy, but they are all lovely. Thanks for the chance! Wow..how generous! I love both Whitney or Grace. Fabulous. Off I go to check out her blog. Found also a great link on her post toDonna at FunkyJunkInteriors about making your blog more visitor friendly..and particularly doing away with the dreaded word verification button that is GLARING AT ME AS I WRITE!! HAHAHA! !..makes leaving comments so much quicker without it! Loving the Witney!! Amazing jewelry, a new fav.!! I love the Laguna...and everything else! Either the Whitney or Mallorie. I would give it to my bestest girl friend. She just had her first baby and I think she would love it! I'd pick the coco - LOVE LOVE LOVE that key! yummy! Great giveaway! I would choose the CHLOE necklace — and have it inscribed with the word "laugh." I once met a girl many years ago who had this word inscribed on a pendant necklace, and the effect it had on everyone around her was nothing short of incredible — people would change from angry or sad to giggly in a matter of moments. Would love the opportunity to continue spreading the giggles! I am following Star Fish's blog. I <3 Coco!!! I've had my heart set on a necklace with a key on it for some time now. All of it is simply lovely. I LOVE the Betsy! It's so adorable, minimalistic, but beautiful and absolutely my style! the whitney. oh how lovely!! thanks for a great giveaway!! I, too, just became a follower of STARFISH. Love it! ;)Alyssa Hope I get picked! I'm a follower of Starfish now! I love the Laguna. Simple, sweet, perfect! Tori is my wish!!! Thanks for sharing this great website!! I would pick Grace for my three beautiful children! Thank you for the giveaway!! Love you Blog!! I love the Tori & The Whitney! Gosh I hope I win!! I now follow the Starfish blog. Peeked through her blog-LOVE IT! Oops-forgot to mention I now follow her on Twitter! p.s shes excited as I am about the new iPhone 4 coming to Verizon!! Love them all! If I must choose one, it would be Shelby, simply beautiful! I love the Whitney. I would put my husband and my name on it.. happy valentines. i am now following star fish...love..
My favorite is the first one shown with the flower in the middle...soooo cute!! I would totally pick the laguna. I love it!!! If i do not get picked, I will end up buying it anyways...AND i really would like to spend that money on more of your awesome stuff!!!! :) Love your blog. I just found their site yesterday...darling pieces! I was going to hint for mothers day that I wanted the shelby with three charms with my kids initials, and I love, love the flower charm! Fabulous!! I just discovered the Starfish blog. Love it and am now a follower. I have 4 kids and would love to get the Tori so all their names could fit on it, as well as our last initial. I love the "Betsy" necklace. Thanks for such a generous giveaway. I love the Harper necklace...sooo sweet! Oh my, I am loving this! I would choose the "Grace." I love the simplicity of it :) plus "GRACE" is my nickname. I love the two circles and heart also! Love all of her work, but I would pick the Coco. I am following the Starfish blog, too! They are gorgeous designs but my favourite would have to be the Whitney. 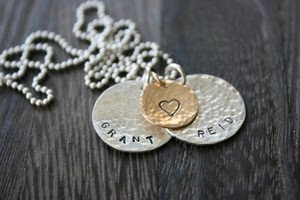 How wonderful to wear a piece of beautiful jewellery that holds the names of your children. I adore the Whitney..perfect simplicity! I am a follower of starfish bog. includes all types of wonderful and beautiful quotations All quotations on the site Cute Love Quotes you will not find at any other site because they are all exclusive, The site put all quotations in beautiful pictures to be shared with everyone, whether your friend, your partner, your spouse, or anyone you want to put a smile on his face quotations are downloaded daily to get all that is new in the world of quotations, I hope that you enjoy at our site with the best wonderful quotes, These short romantic sayings about love can be shared with your loved ones.